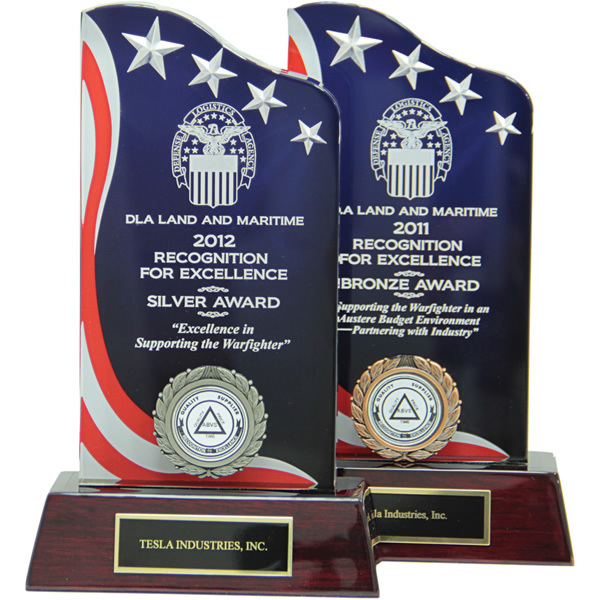 Once again, Tesla™ Industries was the recipient of the Recognition for Excellence Award for 2012. This time it was the Silver Award! In 2011, Telsa won the Bronze Award for Recognition for Excellence. This award acknowledges Tesla™, who attained an exemplary level of contract performance. There are over 5,500 venders that compete for this prestigious award. As one of the Defense Logistics Agency’s Land and Maritime’s quality suppliers, Tesla™ plays a critical role in the ability to maintain the highest level of support to the men and women in the armed forces who defend our shores and freedom around the world. To be eligible, vendors must have shipped 50 or more contract line items during a 12-month period. To qualify for a Gold Award, a contractor must have a perfect score of 100. A score of 99 to 99.99 earns a Silver Award, and 98 to 98.9 earns a Bronze Award. © 1992-2019 Tesla™ All Rights Reserved.